The secondary bond market yields increased further yesterday, with continued selling of the 15.03.22, 15.03.24, 15.01.27 and 01.05.29 maturities, as their yields hit intraday highs of 10.64%, 10.97%, 11.20% and 11.32% respectively, when compared against the previous day’s closing levels of 10.50/65, 10.85/00, 11.00/10 and 11.20/30. Furthermore, maturities consisting of the 01.05.20, the 2021’s (i.e. 01.03.21, 01.05.21, 01.08.21, 15.10.21 and 15.12.21), 15.03.23 and 15.06.27 traded at levels of 10.10% to 10.20%, 10.40% to 10.50%, 10.75% to 10.83% and 11.18%. However, buying interest at these levels curtailed any further upward movement. At today’s bill auction, a total amount of Rs. 25 billion will be on offer consisting of Rs. 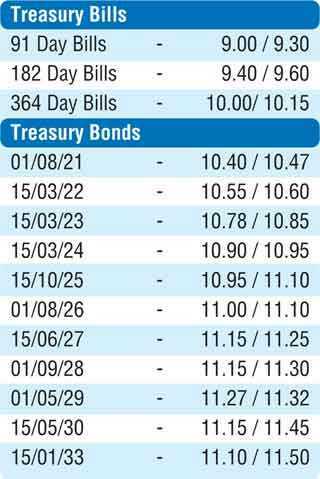 5 billion each of the 91 day and 182 day maturities and a further Rs. 15 billion of the 364 maturity. At last week’s auction, the weighted average yields decreased across the board by 15, 17 and 25 basis points to 9.24%, 9.50% and 10.15%. The total secondary market Treasury bond/bill transacted volumes for 8 April was Rs. 3.46 billion. In the money market, call money and repo rates averaged 8.52% and 8.55% with the OMO Department of the Central Bank injecting liquidity by way of an overnight and seven day repo auction for amounts of Rs. 5.40 billion and Rs. 6.00 billion respectively at weighted averages of 8.50% and 8.51%. The net liquidity shortfall in the system stood at Rs. 5.00 billion. The OMO Department also infused a further amount of Rs. 21.12 billion by way of a 14 day term repo auction at a weighted average rate of 8.55%, valued today. Meanwhile in Forex markets, the USD/LKR rate on spot contracts depreciated marginally yesterday to close the day at Rs. 174.70/85 against its previous day’s closing level of Rs. 174.60/70. The total USD/LKR traded volume for 8 April was $ 67.35 million. Some of the forward USD/LKR rates that prevailed in the market were 1 month - 175.65/80; 3 months - 177.50/65 and 6 months - 180.40/55.